I just had to come here to see what you had written after reading your comment on Choclette's site that this was your first cookbook. It was mine too, also a gift from my aunt and uncle! I wonder how many other food blogging children of the mid 60's still have this on their bookshelf? 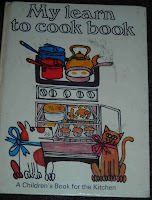 Hee, hee - maybe it was the only cookbook around at the time. I remember being very proud of it.